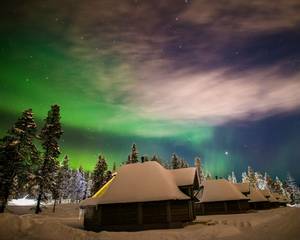 The Northern Lights Village in Saariselkä is the perfect place to stay if you want to combine searching for the Northern Lights with a host of winter activities and the potential to enjoy nearby ski slopes. Sleeping in a glass-roofed cabin is a wonderful experience and, if the weather is right, the night’s sky out here is breathtaking to witness. 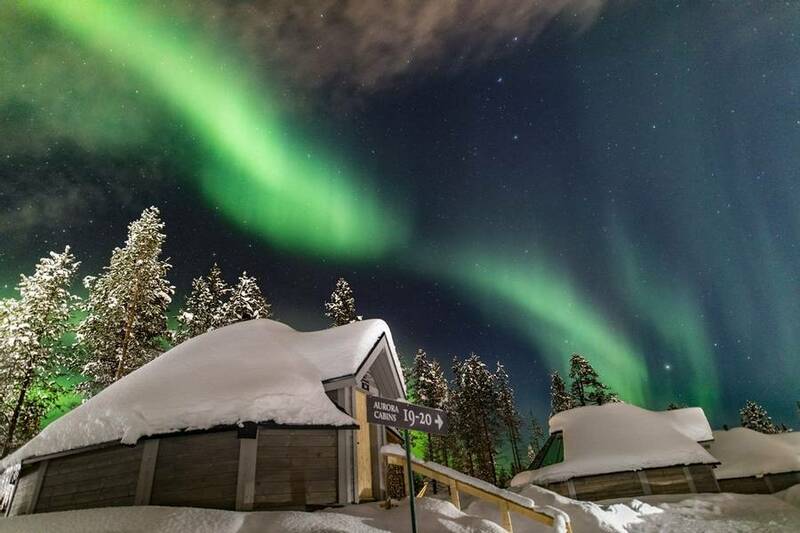 A tailor made holiday at the Northern Lights Village creates the remarkable possibility of witnessing the Aurora Borealis from the comfort of your own bed. 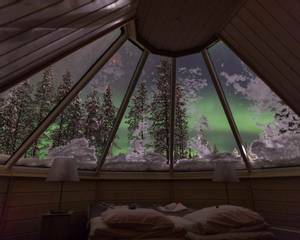 The accommodation for the duration of your stay here in the very heart of Northern Lights territory will be in innovative north-facing, glass-roofed Aurora cabins. 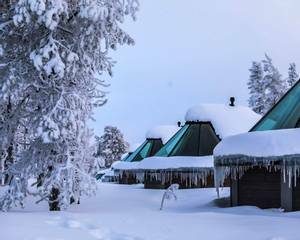 The village is near the small ski resort of Saariselkä which means you can tailor your holiday to combine the likes of dogsledding and downhill skiing by day with Aurora hunting at night. 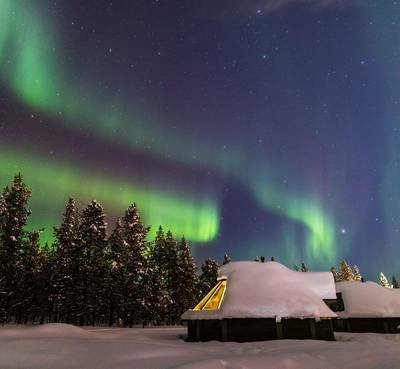 The Northern Lights Village is the latest in Finland’s increasingly diverse selection of Aurora friendly accommodation. 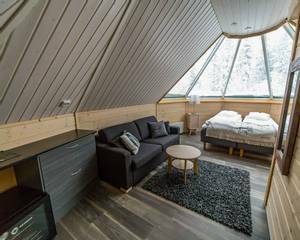 Unlike many destinations where you spend just one night in an Aurora cabin, here it’s for the entire duration of your stay. 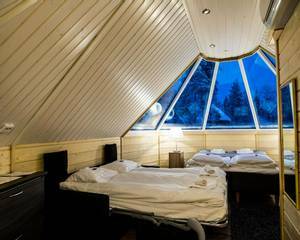 Essentially, you go to bed under the stars and, with a bit of luck, the Northern Lights, but in the comfort of a warm and cosy glass-roofed cabin. 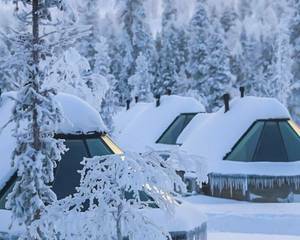 There are 80 such cabins at the Northern Lights Village which is situated just 1000 metres from the amenities in the centre of Saariselkä. 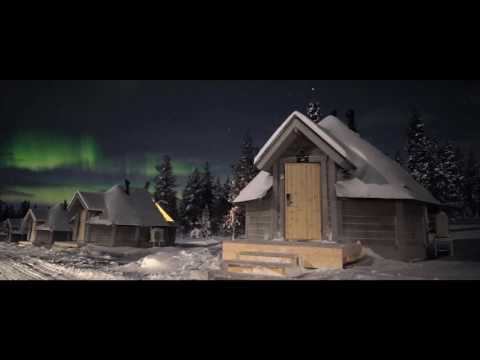 The cabins are cleverly protected from the lights of Saariselkä's more distant ski centre by dense northern woodland. Being in the very heart of the Auroral Zone, the chances of watching the lights whilst lying in bed are really rather good. Wouldn’t that be a story to tell when you get home? 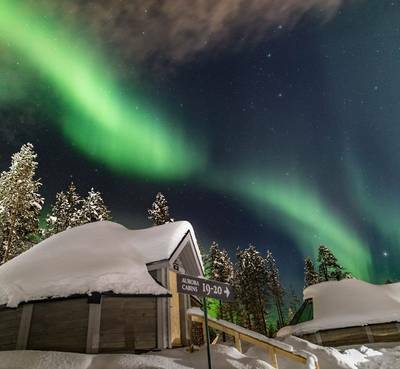 Essentially, these tailor-made Northern Lights holidays have it all: Aurora cabins, easy access to downhill ski slopes and an extensive range of winter activities which can be tailored to suit your requirements. After selecting your preferred holiday duration (a minimum of three nights is required) you choose the activities that best suit you. Lapland’s gently rolling fells and snowy forests are just waiting to be explored and our team of experts are just a phone call away (01670 785 012) if you need any advice about how best to go about it. There are dog sledding and snowmobile safaris of various lengths so you can choose whether you want a taster or longer adventure. 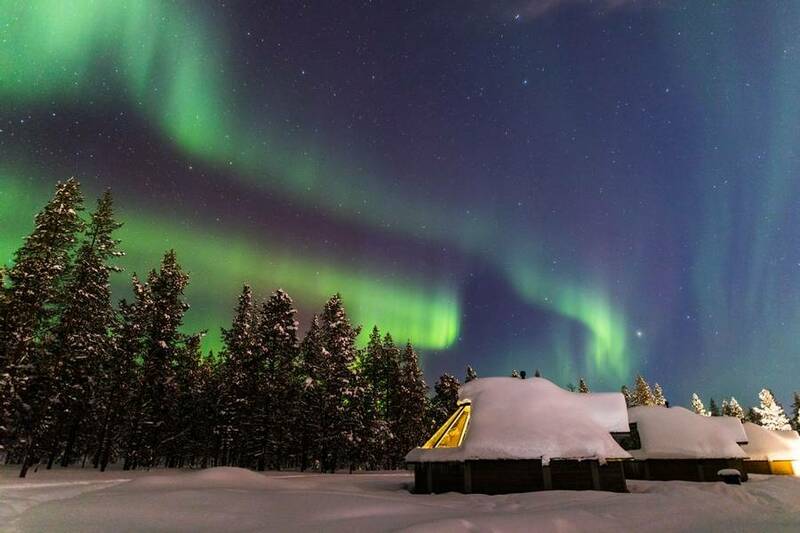 If you prefer to delve into local traditions and culture then we offer trips to the famous Sámi Siida Museum as well as introductions to cross-country skiing and snowshoeing. 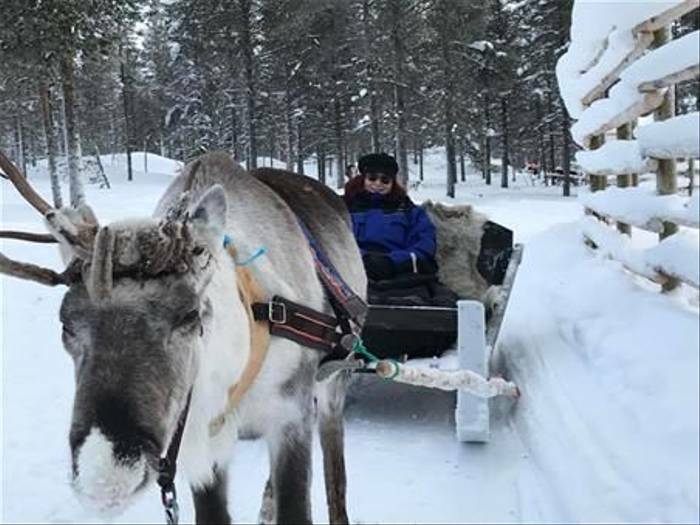 Reindeer are synonymous with this part of the world and meeting a herder and enjoying a gentle reindeer-pulled sleigh ride is another “must-do” activity here in Finnish Lapland. What’s more, all activities begin at the Northern Lights Village so you’ll waste no time with transfers to activity start points. 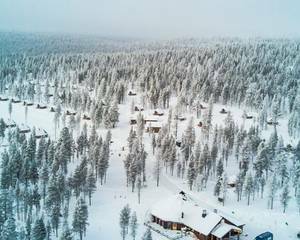 Saariselka also has 15 downhill ski slopes and is renowned for its network of cross-country ski trails so there really is an activity here for everybody. After darkness falls, it’s time to get out in search of the Aurora and you can also choose your preferred means of tracking down “the elusive lady”. 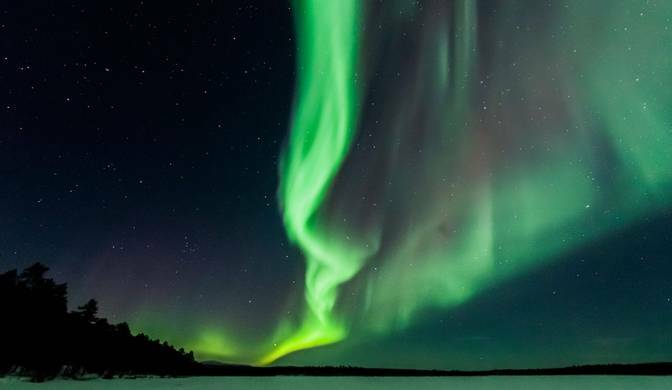 There are remote Aurora Camp excursions along the Russian border, snowshoe hikes, minibus hunts and snowmobile adventures, all of which are led by expert local guides who will do all they can to help you witness an Auroral display. Our friend Markku, whose vision created the Northern Lights Village, is an Aurora nut. He lives and breathes the Northern Lights and is rarely happier than when he is capturing them on camera. He knows that photographing the Aurora is also an important aim for our guests and all our Northern Lights activities here include elements of Aurora photography. If you’ve got all the kit, then your guides will help you to capture the lights on your own camera. If you prefer to watch rather than photograph then you can buy the guides' images to take home as the ideal souvenir. 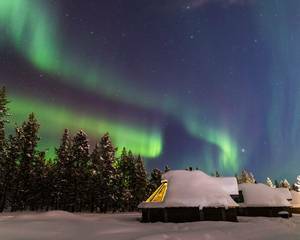 For a flexible Aurora hunting holiday, staying in dedicated Northern Lights accommodation, then there are very few places which can surpass the Northern Lights Village. The village restaurant is an atmospheric place, inspired by traditional wooden kotas (Finnish teepees). Breakfast is a buffet of continental options and some hot dishes. Evening meals are a buffet with starters of soups and salad, a choice of local meat or fish will follow (the reindeer and white fish in this region are delicious!). Typically a cake will be served for pudding, keeping you well-fuelled for your nocturnal Aurora hunting adventures. Dietary requirements are all well-catered for as long as we are informed at the time of booking. For all Northern Lights activities, an expert guide will provide you with photographic tuition. If you do not have an SLR camera and tripod then they can both be rented locally. Your guides will also take pictures throughout the activities which can be purchased on your return to the village. Local expertise and mobility are two of the key elements required for Aurora hunting success and this activity delivers on both fronts. In the company of an expert local guide, you will travel by minibus to the shore of Lake Inari, a vast expanse of frozen water situated to the north of Saariselkä. The size of the lake means it provides an open view of the northern skies and is known locally as being an excellent spot for viewing the Northern Lights. In a remote spot, either on the shores of Lake Inari or nearby Lake Rahajarvi, your guide will lead you to a wilderness shelter. A fire will be lit and warm drinks and snacks will be served to ensure that you are as warm and comfortable as possible while you wait to see if the Aurora will appear. 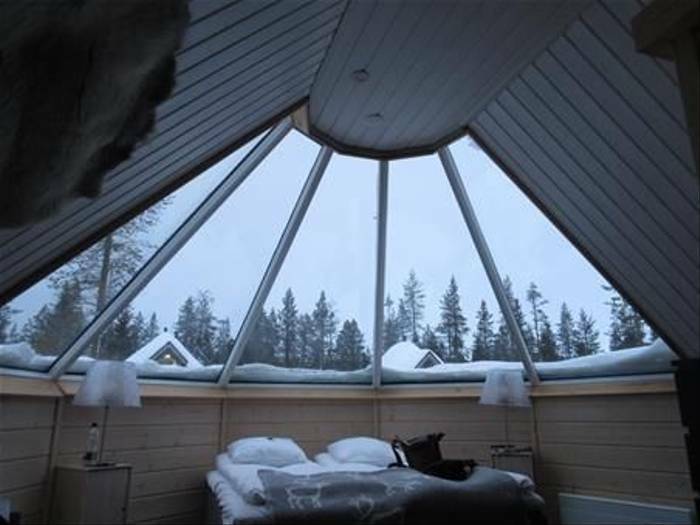 You can remain inside the cabin or, why not take one of the reindeer rugs, lie back on the snow, sip your hot drink and immerse yourself in the near perfect Arctic silence? Your guide will provide you with tuition on how to photograph the Northern Lights and should they appear, they will also take photographs for those who do not have their own equipment. The guides' imagery can be purchased when you return to the Northern Lights Village. Alternatively, you can rent it locally. Availability: Monday to Sunday at 8 pm from December until mid-April. Please note that the time may vary throughout the season. Dog sledding is one of the most popular winter activities and from the moment you meet your team of hugely enthusiastic huskies you know you’re in for an unforgettable experience. 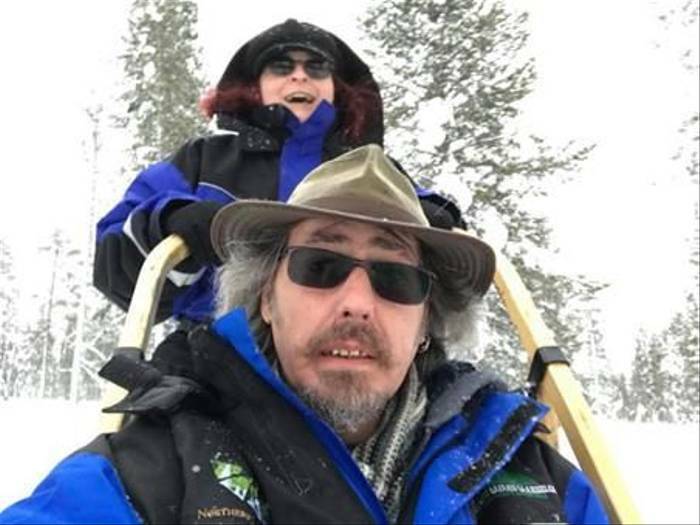 Your expert musher guide will show you how to handle the sled before you set off on the snowy trails travelling two people per sled (you can change drivers half way). The dogs will fall silent as soon as the lines become taut and they focus on their favourite task, pulling the sled. The scenery here is wild but a thick blanket of snow makes it seem calm and serene. One thing is sure; there can be few better ways to explore it than with a team of dogs. You have the option of picking a one, two or four-hour husky safari. If you opt for the four-hour safari, lunch is also included. One hour: £99pp available from Monday - Sunday at 9:30 am from December until mid-April. Please note that the time may vary throughout the season. Two hours: £127pp available Monday, Wednesday, Friday and Sunday at 10:30 am from December until mid-April. Please note that the times may vary throughout the season. Four hours (including lunch): £187pp available Tuesday, Thursday and Saturday at 10:30 am from December until mid-April. Please note that the time may vary throughout the season. This twenty-five-minute reindeer-pulled sleigh ride will take you on a short journey around the reindeer paddock and the surrounding woodland, giving you the chance to see these animals from a new perspective. Your experienced driver will control the sled, leaving you free to soak up the sights and sounds. Available from Monday - Sunday at 9:30 am. Please note that the times may vary throughout the season. You will meet with a local reindeer herder and hear tales from the trails as you learn about reindeer husbandry. You’ll get the chance to feed the animals before enjoying a reindeer-pulled sleigh ride. The reindeer and sled will be under the control of your guide leaving you free to capture it all on camera and enjoy the sights and sounds of this atmospheric experience. Available: Monday to Sunday at 9:30 am from December until mid-April. Please note that the time may vary throughout the season. This region is steeped in the indigenous culture of the Sámi people and their traditions still hugely influence the area. Anyone with a desire to learn more about this centuries-old way of life should visit the Sámi Siida Museum in Inari, the destination for this activity. Travelling by minibus you will head north through Ivalo to the village of Inari. There will be a break for photographs on the banks of vast Lake Inari – the third largest lake in Finland - en route. 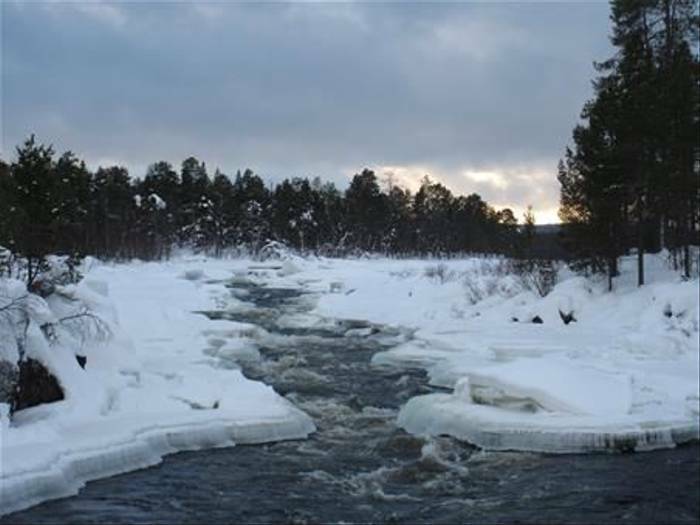 On arrival in Inari, you will head to the Juutuanjoki River. The fast flowing water here does not freeze as the rapids prevent it; the result is that the surrounding snow and ice is carved into eye-catching ornamental patterns. You’ll have lunch around an open fire before continuing your journey. Next, it is on to the museum for a chance to enhance your understanding of Sami culture during a guided tour. There is also a photographic presentation on the Northern Lights to enjoy and an excellent gift shop selling local handicrafts and souvenirs before your return to the Northern Lights Village. Saariselkä is renowned as a cross-country skiing destination and this ever popular sport attracts Finns to the region each year. Your instructor will show you the ropes and, once you have mastered the basics, you’ll have the chance to enjoy some of the local trails. This is a great activity to try near the start of your holiday as equipment can be hired locally if you would like to hit the trails independently later on in your stay. Availability: Thursday and Saturday at 11:30 am from December until mid-April. Please note that the times may vary throughout the season. Available: Wednesday, Friday and Sunday at 11:30 am from December until mid-April. Please note that the times may vary throughout the season. Available: Monday - Sunday at 2:30 pm from December until mid-April. Please note that the times may vary throughout the season. Available: Tuesday, Thursday, Saturday and Sunday at 10:00 am from December until mid-April. Please note that the time may vary throughout the season. Available: Monday, Wednesday and Friday at 10:00 am from December until mid-April. Please note that the time may vary throughout the season. Tonight, following a short transfer, you will set off with your guide and travel on foot to a fellside shelter. Thankfully you’ll be wearing snowshoes so you won’t sink into the powdery snow which can be over a metre deep. The silent forests are only disturbed by the creak of the snowshoes as they compress the snow underfoot and the only light will be that of your head torch and perhaps the moon overhead. It never seems as dark as you might imagine, however, as the snow reflects a great deal of light. At the shelter, your guide will build a fire and serve warm drinks and snacks as you wait, deep in Aurora territory, in the hope that the lights will start to dance overhead. Should they appear, then your guide will help you to capture them on camera and will also take photographs which you can purchase locally should you wish. Availability: Tuesday, Thursday and Saturday at 8:00 pm from December until mid-April. Please note that the time may vary throughout the season. Snowmobiling at night is a completely different experience. The dark forests and trails are illuminated only by your headlights creating ghostly shapes and shadows in the snow ahead. Having ascended the side of a nearby fell, your guide will stop at a prime Aurora viewpoint. A fire will be lit and warming drinks and snacks will be served. As you wait for the Aurora to hopefully dance overhead, your expert local guide will show you how to capture the lights on camera so you’re ready if they appear. If you do not have a suitable camera and tripod then they can be rented locally. Your guide will also be capturing any display on film and his or her images will be available to purchase if you prefer to leave it to the professionals. Full instruction and a safety briefing will be provided before the activity and you will travel two people per machine. For those who would like to drive their own snowmobile, a supplement is payable. Please speak to our Travel Experts (01670 785 012) for further information. Alternatively, if you would rather not travel via snowmobile, you can opt to sit in a sledge pulled by your guide’s snowmobile. Availability: Monday to Sunday at 8.30 pm from December until mid-April. Please note that the time may vary throughout the season. This snowmobile-pulled sleigh journey is one of the most innovative ways we have found to search for the Northern Lights. The sleigh is enclosed and heated, insulating you from the sub-zero temperatures outside. With approximately 8 passengers per sled, the guide will lead the way on his or her snowmobile, pulling the sled up to the top of a local fell and far from any light pollution. Fells provide uninterrupted views of the night sky and provide excellent Aurora viewing should conditions be favourable. Your guide will get a fire burning and warm your cockles with hot drinks and snacks as you wait for a first glimpse of the Northern Lights. Displays can emerge very slowly from the inky blackness of the Lappish sky or suddenly appear out of nowhere so be sure to keep your eyes fixed firmly skywards. All of the Aurora guides from the Northern Lights Village have expert knowledge about how to capture the Aurora on camera and they’ll help you compose your shots. If you don’t have the necessary camera and tripod then they can be hired. Your guide will also be snapping away and his or her images will be available to purchase at the end of the evening. 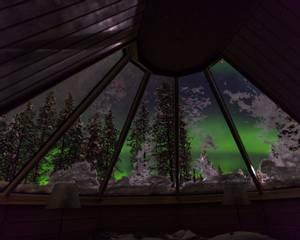 Our friends at the Northern Lights Village have, over the course of many years, researched the best places in the region for Aurora viewing and created Aurora Camps in their favourite spots. Travelling by minibus you’ll head North East of Saariselkä towards the tiny village of Nellim on the shores of Lake Inari. You’ll follow a small road past the village which will eventually bring you to Finland’s border with Russia where there is definitely an air of James Bond! You’ll continue on, alongside the border, to Paatsjoki River Bridge, a place which features in many a glorious Aurora image. This is a renowned Northern Lights viewpoint and if the lights decide to dance overhead, you’ll be in for a real treat. Your guide will provide photography tuition and if you don’t have the necessary kit you can rent equipment at the Northern Lights Village or alternatively, you can purchase your guide's images at the end of the activity. 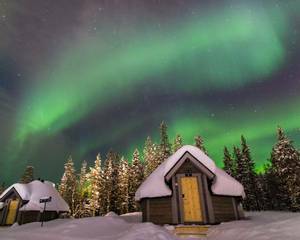 The Aurora cabins are owned and operated by professional Aurora photography guides who have a passion for the Northern Lights and capturing them in all their glory. If you would like to rent an SLR camera and tripod to try and get the perfect Aurora photo, they can be rented on a day and night basis and be taken on all of your excursions. With expert guides to hand, you’ll be shown what settings to use and the best techniques to enhance any images you may capture. Please note: For new bookings taken after the 25th January 2018 a 10% discount is applicable for departures between the 25th January and the 9th February and the 20th March and 31st March 2018. The discount will be applied at the time of booking. Valid for a limited time only, terms and conditions apply. We absolutely loved everything we did. The aurora hunt was a very special trip even though we didn’t see the aurora at this time. The cross country skiing was so much fun and we were encouraged to go at our own pace through a lovely encouraging guide. We did the reindeer sleigh ride and loved that the guide came down the line and offered to take everyone's picture on their own phone/camera. My husband enjoyed the dog sledding the most! Read more accommodation was very clean and beautifully laid out. Lying at night under the glass roof in the cosy warmth of our cabin, watching the snow fall around the cabins and trees, was sublime. The reindeer sleigh rides were informative and made me feel I was in a film! The beauty of the village was almost unreal. Although I fell off the husky sled whilst driving, I did not hurt myself due to landing in the four feet of snow by the side of the track, and it was thrilling and such an adrenalin rush to drive I wanted to do it again straight away. We were lucky enough to be the only two for the Siida Museum trip and our guide, Yuka, was very well-informed and solicitous of our comfort. Quite simply put, there is nothing that could have been improved about our whole experience. The trip was a dream from start to finish. The most enjoyable trip for us was our first trip out to the Lake because we got to see the Northern Lights. Overall the place is amazing and we loved it. We loved our cabin at the Northern Lights Village. Husky sledge driving was great fun with good instruction.